Mahalakshmi Vratha or Mahalaxmi Puja which begins on the Bhadrapad Shukla Ashtami Tithi and ends on Ashwin Krishna Ashtami Tithi (eighth day after full moon in September). 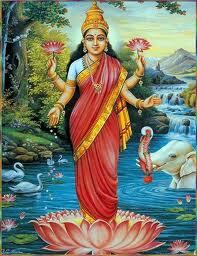 In 2012, Mahalakshmi Vrata begins on September 23 and ends on October 8. 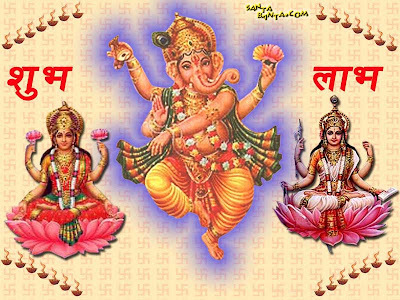 The Mahalaxmi Vrata is observed for sixteen days and is mainly followed in Bihar, Madhya Pradesh and Uttar Pradesh. Legend has it that Goddess Parvati has once asked Lord Siva about a vratam, performing which would render the women on the earth blessed with all kinds of wealth. Then did Lord Siva preach of "Vara Laksmi Vratam" to be performed on a Friday that comes just before the full moon day in the month of Sravanam. Illustrating the sanctity of the vratam, Lord Siva narrated the story of Charumati of Maratha desa, which runs like this. Once upon a time, there lived a gracious and wise Brahmin lady called Charumati in the Maratha Desa, a town that had golden houses and golden walls. Charumathi was a Maha Pativrata, indulged in a whole-hearted worship of her husband and looked after her in laws with utmost respect. Pleased with her good nature, Goddess Lakshmi happens to appear in her dream and advises her to perform the Varalakshmi vratam on Sravana sukla sukravaram preceding the full moon day. Charumathi prostrates in devotion to the Goddess in the dream itself and the next morning illustrates the dream to her husband and in-laws. With their consent, she tells the same to a few more women folk of the town and they together wait the day. The much-awaited day finally comes and they set stage to worship the Goddess Vara Lakshmi at one corner of the house, which is cleaned up with cow dung. All of them perform the puja to the Kalasam with all devotion and piety, tie the toram to their wrists and offer prasadam to the Goddess. Then does the miracle start as they go about to take the Pradakshinas after the puja. They see themselves bedecked with various ornaments one at a time as - anklets on feet for the first, bracelets for the second and various other ornaments for the final pradakshina. Excited about the blessing of Vara Lakshmi, they once again prostrate to the Goddess and honour the Pundit with due Dakshina and conclude the vratam by taking the prasadam. As the women folk stepped out of the house do they see their houses decked with all riches and golden chariots awaiting them outside Charumati’s house. Extremely happy about what all had happened, the women thank Charumati for having shared her luck with them. Ever since then is the Vara Lakshmi Vratam performed in every household on this auspicious day. Legend also say that the vratam was later also preached by sage Suta to Sounaka and other sages. Another legend is that Chitranemi who was one cursed by Parvati for having made a partial judgement in favour of Shiva when asked to play the referee for their game, got relieved from the curse by having watched this vratam performed by some pious women. Such is the sanctity of the Vrata. 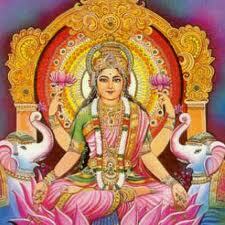 During Mahalakshmi Vrata, Sun God (Surya Bhagwan) is also worshipped. Sun God is offered water in early morning. 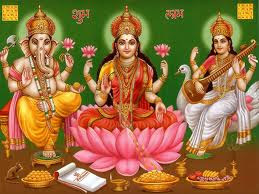 Mahalakshmi Vrata in North India is continued for 16 days starting from Bhadrapad Shukla Astami till Ashwin Krishna Astami. 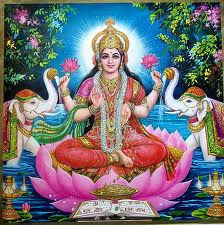 As a part of Lakshmi Vrata in North India, Mahalakshmi Vrat katha is recited. A pot is filled with water and adorned with betel leaves. Keep a coconut on the top of the water filled pot. Now dress the pot with red cloth and tie a red thread around the pot. On the pot, draw four lines with kumkum. The four lines indicate the Chatur Vedas. A Swastik is drawn on the pot. Swastik is the representation of prosperity and purity. Now, the pot with all these decorations is referred as Kalash or Purna Kumbh which represents the Universal power (Supreme deity). Akshata (consecrated rice) are kept and some coins are placed in the water in Kalash. This Kalash or Purna Kumbh is worshipped as Goddess Maha laxmi. The simple Lakshmi pujas like lighting diyas and deepa are performed. Lakshmi Ashtottara Satanamavali and Lakshmi Sahasranama stotra are recited during Mahalaxmi Vrata. Place a mattress against eastern wall of the house or office with white bed sheet where Lakshmi Poojan is to be performed. Chaurang should be placed against the wall with Lakshmi facing West or East. Place a Toran (Preferably of Marigold flowers) on the Door. Decorate the surrounding of Pooja Stage as per your liking with Rangoli, flowers, lighting etc..